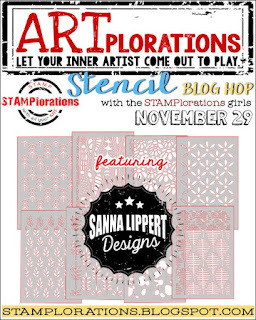 We've got a new designer in our midst at STAMPlorations, and it's our very own Sanna with her line of stencils! To celebrate the launch we're having a little blog hop, and winners will be randomly drawn from comments left on the STAMPlorations blog and participating designers' blogs. 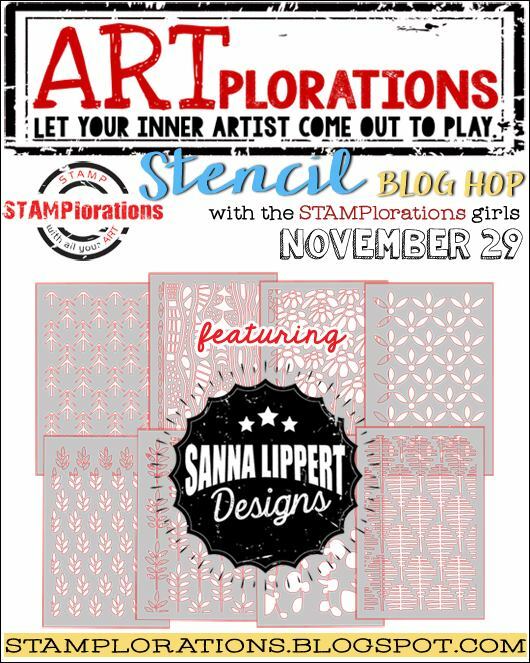 You could win a $20 gift certificate, or your choice of 3 Sanna Lippert Designs stencils. For this first card I used Trees1 with Peeled Paint Distress Oxide. On some separate card I sponged more Peeled Paint, and a bit of Forest Moss DI, then stamped two holly leaves from Layered Holly. Added some Christmas washi tape and card candi berries, and mounted the whole thing onto dark red card. This second card uses Senecio1, which is a stencil/mask set. I placed the masks on my card, sprinkled PaperArtsy Infusions in the gaps, then spritzed with water, dabbing it with kitchen roll before it got too muddy, then removed the masks. I wanted to add definition to the pretty flower circles, so I drew in all the circles first with a 0.8 fineliner, then drew in the stalks. I couldn't decide what sentiment to add, but, to be honest, I like it as it is without a sentiment, with the pattern showing in all its glory. Pop on over to the STAMPlorations blog to see all the gorgeous creations from the team. You have until Monday 4 December to comment! Swooning over your gorgeous showcases! The trees, with your holly accent, is so eye-catching! The outlined Senecio...oh my stars! In love! Your cards are really gorgeous!!! These are both gorgeous, Shirley. 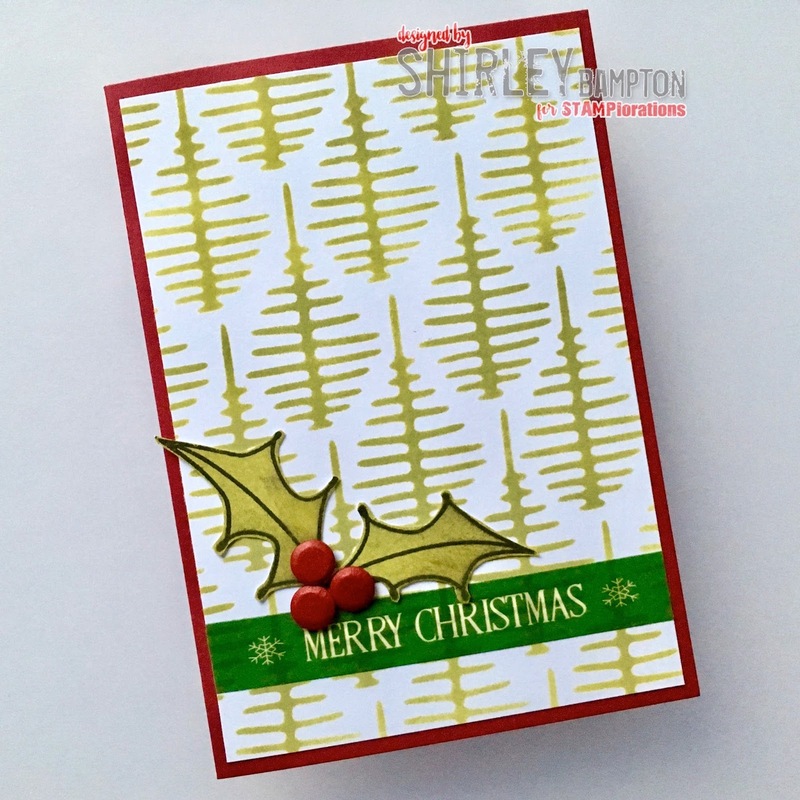 The trees look wonderful with the holly and the black lines really add a whimsical feel to the second card. Forgot to mention I really like your 1st card too with the tree pattern, washi tape and your wonderful holly leaves. TFS Happy Holidays. These are so beautiful! I really love the first one with the holly. That is so gorgeous with that stencil in the background. Oh my, these are brilliantly done! I love that bubbly stenciled card. Looks soooo amazing. Both are stunning with your innovative ideas ans so much fun with these gorgeous new stencils, love them! Love your fantastic card designs. Great ideas. wonderful mf...I'm partial to the second card, love how you added the blackline details. I love that this card can be used for any occasion since it has no sentiment. The coloring you did here is just beautiful and really highlights how pretty this stencil is. Wow! That background on your second card is lovely! I love how you used that stencil. Gorgeous cards! Love the second card. Looks so pretty. Wow...these are both so amazing! I like the graphic designs of your cards. Love, love these cards! Great colors and stencils! I love your fresh design!